BAKKO Pro Flat Series - 10' x 12' [1-BKB2704-12] - $4,100.00 : Signature Tennis, Your source for Country Club quality products and services for all your tennis court needs. Panels are 2 1/2" thick with metal interior frames dividing each panel into 20 sub-compartments. Each sub compartment is filled with sound deadening materials. 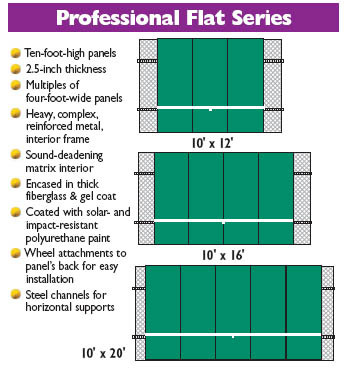 Panels are encased in thick fiberglass and UV protective gel coat unitized under pressure in large molds. Front and edges of panels are sprayed with a high quality impact, solar and temperature resistant green polyurethane Imron paint. Panel faces have no holes; attachment is in back with wheels. Wheels allow panels to roll in galvanized metal channels horizontally attached to fence post. Each panel weighs 150 lbs. Flat backboards are traditional; this is Bakko's oldest model and over the years, a best seller. Ten foot high panels. 2.5 inch thickness. Sound deadening matrix interior Encased in think fiberglass & gel coat. Steel channels for horizontal supports. Heavy, complex reinforced metal interior frame. Multiples of four foot wide panels. Coated with solar and impact resistant polyurethane paint. Wheel attachments to back for easy installation.